Plate 3 Algal stromatolites and oncolites in Limestone IX of the Randerston Limestones, Strathclyde Group, Carboniferous; Randerston. Excursion 11, Location 1. (Photo J. A. Weir). Walking distance 5.5 km of farm road, rocky and sandy beach. Purpose The main objects of this excursion are to examine: (1) Carboniferous rocks known to lie very low in the Strathclyde Group succession (Table 4) of East Fife (including the well known Randerston Limestones: see (Table 5); (2) strata belonging to the Balcomie Beds of the Inverclyde Group. Notes The shore section is divided into three areas by faults and the relationships between the areas is unknown. Only the rocks in Area I have been correlated with others in Fife. Forsyth and Chisholm (1968, p. 75) reported a marked similarity between the Area I rocks and those of the Anstruther borehole. Neves et al. (1973), however, disputed this on palynological evidence. Both groups, however, place them in the Anstruther Beds of the Strathclyde Group. The rocks in Area II are the oldest in the section and can be correlated with the Inverclyde Group Balcomie Beds of Fife Ness. The age of these beds is however, unclear. Forsyth and Chisholm (1977, p. 8) placed them in the Upper Old Red Sandstone and Browne (1980) correlated them with the Downie's Loup Sandstone of the Inverclyde Group in the Stirling area. The sequence of Area III is thought to belong to the lower part of the Anstruther Beds of the Strathclyde Group (Forsyth and Chisholm 1977, p. 20), but no detailed correlation exists. The outward route from St Andrews is by A917 travelling south-east through Kingsbarns (9.5 km) to the entrance to Randerston Farm [NO 602 101]. Dismount, send the bus back to Kingsbarns Harbour and walk down the farm road (seek permission at the farm) to the shore. Follow the track eastwards, noting en route the good cliff feature at the back of the postglacial raised beach and pass the old quarry where Limestone VII of the Randerston Limestones was once worked, but which is now filled in. Alternatively, take the bus to Kingsbarns Harbour and walk south-east along the coast to this point. Four hundred and fifty metres south-east from the point where the farm road reaches the coast, there is an anticline on the shore [NO 615 110], the rocks in the centre of which comprise the lowest part of the succession in Area I. The succession within Area I can now be examined by walking along the shore to the north-west, studying the section through this anticline and the syncline which follows it to the north-west. For 600 m the strata exposed on the shore display an alternation of sandstones and shales with subsidiary siltstones, sandy shales, thin limestones, now dolomite (the Randerston Limestones) and coals, the last being seldom exposed. The simplified succession tabulated below is based largely on that in the East Fife Memoir (Geikie 1902, pp. 123–6) after Kirkby (1901). The general inclination of the beds is 10°–20°NW as far as the synclinal axis. The beds were numbered individually by Kirkby and his numbers for the limestones are given below to the left of the limestone's name. Within this succession the following features may be noted: (a) the thick, well bedded sandstones form prominent ridges on the shore, but, where strongly cross-bedded or contorted, they are planed off remarkably flat as wave cut benches without dip or scarp slopes; (b) Limestone VII is the only limestone with articulate brachiopods; (c) Limestone IX is a most striking rock with its hematite stain and stromatolites* (see plate 3); (d) Limestone VI contains the high-spired gastropod Donaldina; (e) Limestone V, a short distance east of the farm road, is very fossiliferous and the top surface, usually covered in seaweed, yields Schizodus, Sanguinolites, Naiadites, Murchisonia etc; (f) the shales beneath Limestone III have been preferentially eroded to form a sandy bay which is clearly discernible from the road when approaching the shore; (g) Limestone III is shaly, thin bedded and packed with Schizodus. Note that the highest beds in the syncline can be seen only at low tide. Please do not collect from the outcrop of this bed. There is abundant loose material on the beach. North-west from the centre of the syncline the succession is repeated in the reverse order without marked variation as far as Limestone VI. At a point about two-thirds of the way from HWM to LWM, the thick sandstone between Limestones IV and V has been involved in a peculiar type of deformation. In this, the lower part of the sandstone has been forced upwards through the upper part. Strongly curved faults appear to have facilitated this, but the cause remains obscure. Laterally the disturbance dies out rapidly and the outcrop of Limestones IV and V are then unaffected. Beyond Limestone VI the succession is probably continued down to about Limestone X or XI. It is poorly exposed but, so far as can be determined, is appreciably thinner than on the eastern side of the syncline. Limestone VII can be detected among boulders 45 m east of the mouth of the Cambo Burn, but thereafter exposure is poor for the next 90 m. A thin hematite-stained limestone, thought to be Limestone VIII, outcrops at HWM on the south-east side of Cambo Ness and by following this limestone down the beach, it soon becomes apparent that the area is heavily faulted. The south-east dip of 25°, seen in the higher beds of the syncline, increases to 60° and locally the beds are even overturned. A 1 m shelly limestone may be examined in a small faulted patch here, but its relationship to the other limestones is unknown. The structure at Cambo Ness is very obscure, much of the area being overlain by large angular blocks of buff sandstone clearly not transported any great distance. Interpretation is rendered even more difficult by the fact that near LWM exposures are absent altogether. By walking a short distance to the west and north-west it will become obvious that there must be a considerable structural disturbance between Area I and Area II. 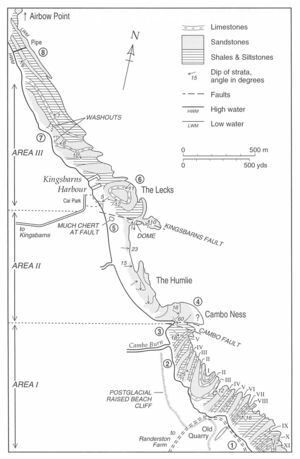 This is attributed to the Cambo Fault. On the northern side of Cambo Ness the rocks are quite different to those of Area I, comprising ill-bedded, buff, reddish, greenish and grey sandstones dipping gently to the south and southeast. These carry cornstones and are sometimes cherty and are assigned to the Balcomie Beds of the Inverclyde Group. The sandstones further to the north are cross-bedded and micaceous and are often muddy, the muddy bands being purple and green. Good exposures of these strata may be examined for 180 m north-west of Cambo Ness, but thereafter are restricted to near LWM. Note here a particularly large erratic block: the Humlie. This is composed of Dalradian greenschist and measures 3 x 2 x 2 m. Scattered outcrops of sandstone occur across Cambo Sands and become more numerous towards the north-western end of the sands. The rocks of Area II are terminated abruptly to the north against an E–W fault, the Kingsbarns Fault. As exposed about halfway down the beach, these rocks consist of massive sandstone and knobbly weathering, massive and brecciated corn-stone with veins of black chert occurring next to the fault. Near LWM, however, they are composed of sandstone and purple mudstone dipping east. These give way near the fault to a dome with marginal purple and red mudstones and, near the centre, a red conglomerate with muddy matrix. The pebbles in the conglomerate are up to 2.5 cm long and consist of much-weathered andesite. This conglomerate with andesite pebbles is unusual. It implies erosion of what must almost certainly be Lower Old Red Sandstone lavas at the time the conglomerate was being laid down. The small size of the pebbles indicates considerable transport of the fragments, e.g. from the present Lower Old Red Sandstone lava outcrop in North Fife. Within Area III, which extends north-westwards from the Kingsbarns Fault to another fault beyond Airbow Point, 1.5 km to the north-west, the structure is very simple, the beds having a gentle inclination to the south-west and south except for a shallow basin at the Lecks near Kingsbarns Harbour. The maximum dip is 16° just north of the harbour. In the basin note the occurrence of a Naiadites shell bank, or biostromal limestone, 1.4 m thick and outcropping as a flat bench. 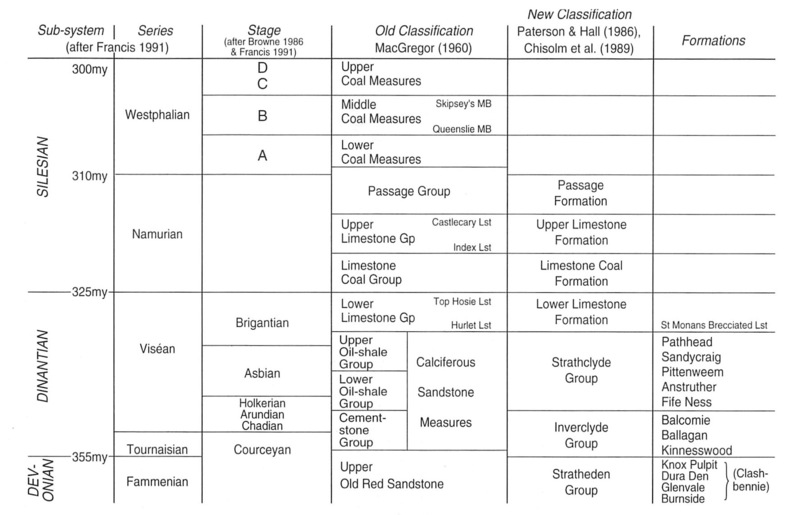 Possible correlations of this limestone with other Strathclyde Group limestones are unclear. Beneath the limestone the sediments are not unlike those of Area I in that, generally, they consist of alternating thick sandstones and shales. At the northern wall of the harbour, examine a sandstone which displays ripple marking, cross bedding, calcareous concretions and hematite staining. The underlying shales, eroded out lower on the beach, can be seen at HWM where ironstone nodules in the shale contain plant fragments and some of the higher shale is bituminous. They are unconformably overlain by very shelly raised beach sediment. 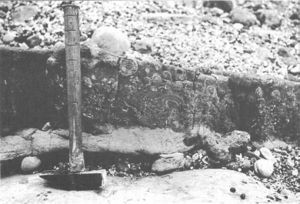 Forty-five metres beyond the north quay at Kingsbarns Harbour, just in front of a pipe, a 1 m limestone, containing Naiadites and many gastropods, caps a thick bed of sandstone. Three hundred and twenty metres north-west of Kingsbarns Harbour a Spirorbis limestone crops out. On its wave-washed upper surface this limestone may be seen to be packed with calcareous tubes of the worm Spirorbis. Beneath it a thick bed of sandstone forms a prominent ridge on the shore running for 0.75 km to the north-west. Near the point where the Spirorbis limestone reaches HWM, two washout channels cut this sandstone roughly at right angles to the strike and break the scarp line. The more northerly of these is of particular interest, being a double washout. A later channel has removed part of the earlier one as well as part of the underlying sandstone. For the next 550 m north-west, the shore runs almost parallel to the strike and only gradually do older beds appear. These comprise shales or clays with a 30 cm bed of limestone 3 m beneath the sandstone. This limestone is shelly at first, becoming less so to the north-west where it takes on a rubbly appearance and develops an irregular top. Beneath this limestone, the exposures provide a very clear illustration of the variability of the strata in this type of succession. Within 450 m of the double washout, a bed of sandstone makes its appearance and increases to 2 m in thickness along the strike. At Airbow Point, the shales again yield Naiadites together with ostracods. Cornstones, some reddish in colour, occur in the sandstones which also have a tendency to take on a reddish colour. The section terminates against another fault. The strata in Area III pass upwards into rocks strongly resembling the succession in Area I with the Randerston Limestones. As such it may be suggested that they lie beneath the Area I rocks within the Anstruther Beds, e.g. Forsyth and Chisholm (1977, p. 32). Walk back to Kingsbarns Harbour and rejoin the bus. Follow the A917 back to St Andrews. BROWNE, M. A. E., 1980. 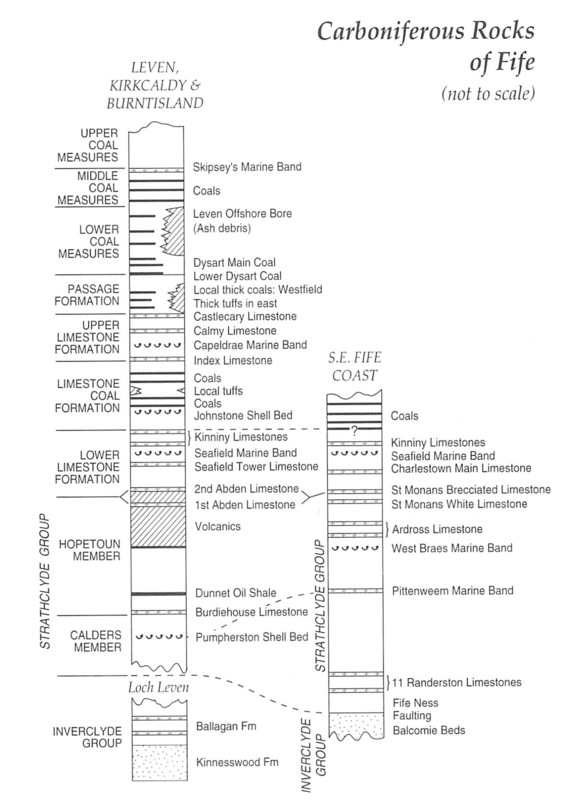 Stratigraphy of the lower Calciferous Sandstone Measures in Fife. Scot. Jour. Geol. 16, 321–8. FORSYTH, I. H. and CHISHOLM, J. I., 1968. The Geological Survey boreholes in East Fife, 1963–4. Bull. Geol. Surv. Gt. Br. No 28,121–35. FORSYTH, I. H., 1977. The geology of East Fife. Mem. Geol. Surv. Gt. Br. GEIKIE, A., 1902. The Geology of Eastern Fife. Mem. Geol. Surv. Scot. KIRKBY, J. W., 1901. On Lower Carboniferous strata and fossils at Randerston, near Crail, Fife. Trans. Edinb. Geol. Soc. 8, 61–75. NEVES, R. et al., 1973. Palynological correlations within the Lower Carboniferous of Scotland and Northern England. Trans. Roy. Soc. Edinb., 69, 23–70. This page was last modified on 23 February 2019, at 10:36.